Great 3 bedroom plus living room located 10 min drive from downtown and 3 minutes drive from local, daily farmers market. Great location, close to everything, hiking trails close by. Kitchen is fully equipped, linen and towels included. Desk/workspace in one of the rooms. Had a fabulous 2+ weeks stay in this well equipped apartment. Would definitely recommend this property. Pros - the apt. Is about 2-3 miles from Brasov sites and about 20 miles to the Bran Castle. The apt. was very clean and the property manager was friendly, helpful, and available. The check in/out times were flexible. And the neighborhood is residential, family oriented, and seemed safe. The nightly cost is fair and appropriate to the accommodations. Cons - The apt was quite difficult to locate. There are several buildings and 1 way or crowded streets. The owner emailed me Bldg 15; it was actually Bldg 14. Directions to the apt. need to be better. The numbers are small, on the entry door and are hard to see. Finally, Radu and Gabby waved us in after we called them twice while driving around in circles looking. There is no AC or fans, so the windows have to stay open in the summer. We stayed on a Saturday night. The apt. Is on the ground floor and people outside made noise until almost 2 a.m., making it difficult to sleep. The bed sheets were clean but definitely not soft. For the cost, it was a good place to stay. There is a good pizza restaurant within walking distance and a nice bakery too. Gabby and Radu were exceptional. I will upload soon couple pictures with the outside of the building, so it's easier to locate. Apartment on ground floor (ideal for those who have difficulty with stairs or do not like using lifts) with easy parking immediately outside. 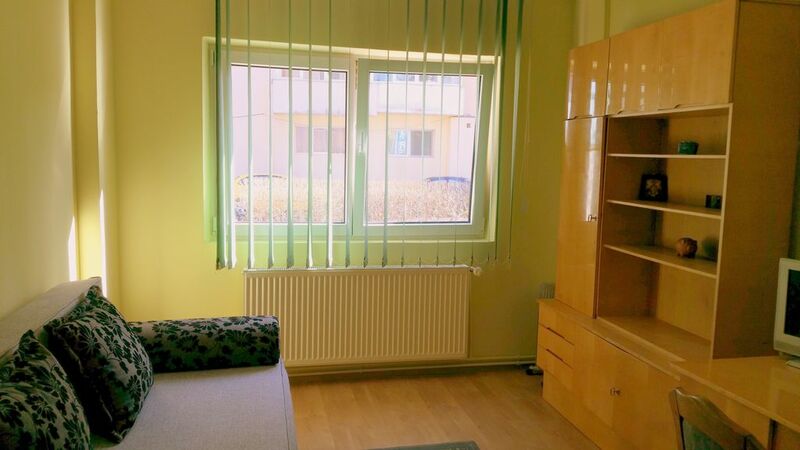 Centrally positioned enabling quick access to both routes out of town and attractive city center for restaurants etc. The apartment has all the facilities you would require for self catering, but with so many places to visit and dining out you wont be in the apartment that much. The photos provided on the website give a good view of the interior of the apartment. One of the exterior of the building would be helpfull so that one could recognize it on arrival. Thank you for your review . so glad that you enjoy your stay with us. having a exterior photo is a good idea , so i will add one. Affordable and comfortable accommodations for an extended stay in Brasov! We just returned from a two-week stay in Brasov to visit family and were so very pleased with this apartment! As a family of 5 (a couple with two young kids and another adult family member) the apartment layout and size were perfect, and the location was very convenient (10 minutes drive or taxi ride to the town square, and, for us, just a couple blocks away from our family whom we were visiting).True to this style apartment in Brasov, every room has a door that closes for privacy and noise control. There is a twin bedroom, a futon (folds out to a queen) bedroom, a queen bedroom, living room with TV, bathroom with standing shower and bathroom with tub. Furniture is minimal and functional, and cabinets throughout the apartment were well stocked with extra linens, towels, cleaning products, a sewing kit, first aid kit, etc., as well as toiletries in the bathrooms (though we used our own). The kitchen cabinets and pantry had all the basics from salt and napkins to plates, utensils and a toaster - we didn't need to purchase anything but food in order to make a homecooked meal. There's a washer machine inside the apartment and drying rack. WiFi worked perfectly, and our kids loved the channel selections (such as NatGeo) on the flat screen TV. Overall, the apartment was affordable, clean (the floors were dusty from not recently being resided in, but it wasn't a problem for us to do a quick mop), unpretentious yet comfortable, and very spacious for an apartment in this neighborhood, and we will definitely ask to stay again when we visit next time. Thank you to the owner and local manager for everything! Apartment was nice and clean and on the ground floor. There was free parking outside. Shops and bakery were nearby. We got a friendly welcome and had a nice stay.